There's no simpler pleasure than channel surfing straight into a favorite movie, turning what could've been a depressing evening alone into a date with Death Wish IV (The Crackdown). Bringing that joy to the paved outdoors, Hollywood MobMov. 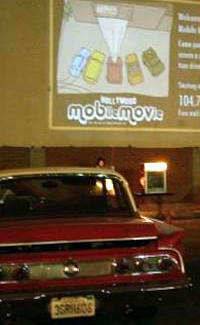 Popping up in parking lots from Culver City to the OC, Mob's a roving, guerilla-style drive-in, started by a filmmaker who'd grown tired of showing his short flicks at stuffy festivals/in his stuffy garage. To pull it off, the founder launches a spontaneous assault on building walls, using a car-mounted projector, DVD player, mixer, power inverter, and FM transmitter, allowing you to listen on your car stereo, provided you can flip the dial away from the soothing blather of Rick Dees. So far, screenings've ranged from the theater-program-saves-gang-ridden-high-school doc OT: Our Town to the more traditional Night of the Living Dead and Re-Animator (Charles Schulz's slasher film?). Mob's email list updates fans on upcoming events, the next being tomorrow's Atwater Village screening of Head Trauma, followed by a director Q+A -- leaving with you with a case of Death Wish V (The Face of Death).